A journey adventure for 6th-level characters. Now that the ruined pyramid tombs of the ancient emperor-gods of Osirion are finally open to exploration, the race is on to plumb their depths and rescue their priceless treasures. 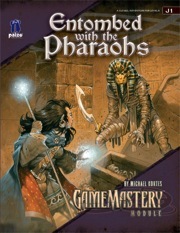 Entombed with the Pharaohs is a desert adventure written by Michael Kortes that pits players against rival adventurers bent on getting to the treasure first as well as the vicious monsters and lethal traps set to stop them from their plunder. Ancient secrets and wealth beyond imagination await you in the pharaohs' tombs—will you be the first to find them? The adventure includes information on the city of Sothis and the ancient tomb that lies nearby, as well as details on rival adventurers bent on getting to the treasure first. I've said it on the Message Boards, and it's time to turn it into a review - Michael Kortes is perhaps one of the best module writers Paizo has on retainer. 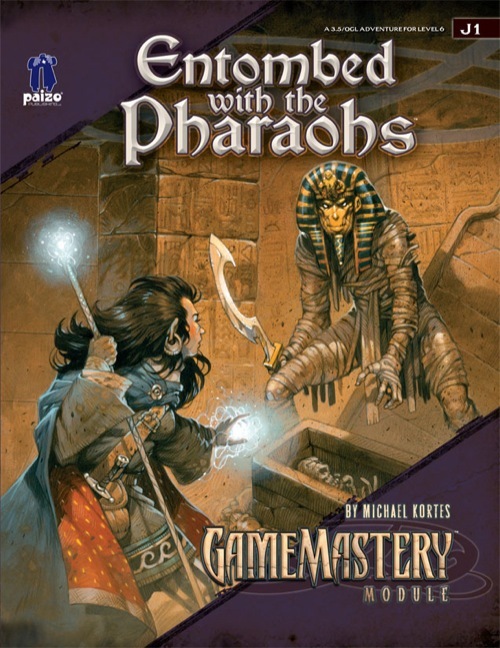 Entombed With the Pharaohs was a well written, fun, and challenging adventure that really balanced character interaction with old-fashioned dungeon delving. The beginning of this module is sheer brilliance - a well done auction that really sets the stage for what's happening. From there characters are whisked away to some thievery and/or negotiations before being thrust in a race with another competing team to the same goal. It is this competing team that really sets the module. Their interactions with the party, whether spying on them or trying to kill them, really makes the module memorable. Frankly I'm a little surprised I like it as much as I do, Egypt adventures don't normally do it for me. The way the mummies were treated, and the opportunity for the group to really develop a grudge against another group make for a great time though, and I'd suggest it to anybody. To be fair, the conversion from 3.5 wasn't entirely kind - the opposing team isn't nearly as strong as it could be, but with a little effort, this module has all the dazzle needed to make for a great five-or-six sessions of gaming. Tomb raiding was never this much fun! A lot is jammed into only 32 pages. The game starts in a surprising and original way. I won't go into spoilers, but I will I don't recall any other adventure starting this way... ever. And it works very well. There is more than just the Pyramid to explore, and in the process make some fun enemies. This adventure is really nicely balanced between social, traps and puzzles, and combat. The occupants are more than just "mummies." Lots of surprises, leads, adventure seeds, area development. If you own Sandstorm, you can really develop this adventure even more and make this a 10 Star adventure. I expect that if this product had had 62 pages available it would have been the finest of all Egyptian-style adventures ever. a truly great adventure. ran it to my players and they loved it. mostly, the story was good becuse they enjoeyd the interaction with the rival team. during the advanture they have sabbotaged and tackled each other's plans again and again, and they even kiddnept members of the PC's team (and the PC's captured one of them and tried to trade back). the greats parts where when the two teams had to cooperate in order to survive extreme situations and tough encounters. Without Julistar and his hierlings though, the advanture isn't that good. I think it is important to make sure PC's don't just confront them at the very begining, by letting them know that Julistar works for a powerfull evil mistress, and that killing him won't be wise. that should be enogh, really. That said, it's the best Gamemastery Module so far, and by far. I'll give 5* to the Module which will rock my world. Emtombed with the Pharaohs does not do the job. Yet it provided us with one hell of a game afternoon. Congrats to M. Kortes. When will this be available as a PDF? After the retail release date, which is next Wednesday. How're the scaling notes on this one? This sounds like it would slot in nicely with my current campaign, but the players will be like 8th-9th level by the time the adventure docket is open. We don't include level scaling notes on the GameMastery Modules line. Stupid question time: What's the "J" for? It stands for "Journey". A bit tenuous in my opinion but I guess the PCs go on a journey to get to Osirion in the first place, then go on another one to get to the pyramid! It's a great adventure though. Just finished reading it and I would like to cast a vote for more development in Osirion. The module doesn't include scaling notes, but an experienced DM should have little trouble adjusting the encounters to suit a ninth level party. There are a few comments in the text that suggest appropriate ways to "beef up" some of the encounters, and some foes can be advanced without undermining the credibility of the encounters. Replace the sphinx with a pair of advanced sphinxes and boost each NPC in the rival group by two levels, with a squad of minions to bolster them. Downstairs, the cerulean pet could grow a bit more impressive, while the hot mama of Osirion undeath gains two or three levels. Advancing her guardian to huge makes balancing the trap even more difficult for the party. Lastly, the numerical fellow advances to huge, making him that much harder to avoid. I'd pay good money for more modules set in Osirion. Osirion has a lot of potential for quasi-egyptian/Al-Qadim style fun. I hope to see Pathfinder stray into Osirion at some point, but until then, more GM modules are appreciated. Yeah, the Journey line is more about the destination than the actual journey, but we can't call it the Destination line because D is for Dungeon. And, as always, C is for Cookie. That's good enough for me. Hmmm. Wasn't there a H.P. Lovecraft/Houdini collaboration story called 'Imprisoned with the Pharaohs'? Yes. That was Erik's inspiration for the name. :) And maybe the concept. I don't know about that for sure, though. Yes. I intentionally named the adventure "Entombed with the Pharaohs" as an homage to that story. If you come from Osirion are you an Osirian? That was the official answer on a thread somewhere that I can't currently find. I join with my good friend Kruelaid in calling for more exploration of this region! Could somebody please tell me the class/level(s) of the pre-gen characters? Thanks. They are level six and the iconics are a fighter, sorcerer, rogue and cleric. And, amusingly, the Fighter is by far the brains of the party. As well as possibly being a lucky, lucky man. Thanks for the quick reply Daigle!!! Well I finally got around to picking up J1. Only had a chance to flip through it, but looks good so far. I must say, as the first Paizo module I've purchased, I am quite impressed by the quality of the printed product itself. What kind of run time can I expect? Can I run this in 2 four hour sessions, 1 eight hour session? Is that a company policy? Why is that? Space considerations, I would guess. They'd rather not cut form the adventure to put in a sidebar that basically will say the same thing in every adventure. Plus it's usually pretty easy to do... take a few class levels away from the BBEG's for lower level parties, add a few hit dice for higher level parties, etc. All characters are made following the character creation guidelines outlined in the thread. I hope some of you pop by and check it out. Post comments, questions or suggestions. A specific shout out to Turin the Mad and Charles Evans to come and join us in robbing those tombs of all they've got! We just managed to "finish" the module, which was felt by the group to be a little too hard, although one has to say that circumstance did cause much of this. d) The group scraped through in the battle against the dragon, but, perhaps rather bullishly challenged the rival party, before they had had a chance to heal up and were wiped. g) They healed up and tried again and lost again - basically they were entering through the secret passage and there was no room to attack the vampire more than 2 at a time. h) I ruled the second time that the vampire Pharaoh's victim would rise as a vampire spawn and one by one members of the party turned into vampires (I know not in the rules) but the group came within 5hp of killing it. So, the party ended up vampires in the service of the vampire "Numbers" Pharaoh. We played this one on-line and it was perhaps a little complex for this situation. L liked the module, but would reconsider again whether a similar type of module was suitable for on-line play (through Fantasy Grounds). I also felt that the group played the module quite well, but they were punished for only very minor transgressions. They were a "low power" group, which did not assist too. I hope they enjoyed it anyway! Vampire Pharaoh of Numbers? An obvious change from the Belker from the module? Why the change? I will admit that I was considering doing something a bit different for that encounter than a simple belker...but a vampire had never entered my mind. It doesn't seem to have the right flavor for Osirion. A new addition...since I am running this adventure via PFRPG rules...the surviving NPCs are getting updated writeups. Scepter was fireballed to near death and then thrown into an Antlion's sinkhole where he became kibble. Julistar and Daile (an NPC added by me to the group) are still at large with some (?) mercenaries still. Init +1 ; Senses Perception +9. Domain Powers Touch of Evil, Protection from Good 3/day, Align Weapon 1/day, Lore Keeper, Comprehend Languages 3/day, Detect Thoughts, Copy Cat (6 rounds), Disguise Self 3/day, Invisibility 1/day. 3rd - 3: Dispel Magic, Suppress Glyph, Axiomatic Rain (2d6/r, 6r, 20ft cyl). 1st - 4: Shield of Faith (+3), Cure Light Wounds, Divine Favor (+2), Bless. Orisons - 4, at will: Message, Read Magic, Stablize, Mending. Feats Iron Will (Human Bonus), Skill Focus: Knowledge - History (1st), Scribe Scroll (3rd), Persuasive (5th), Combat Expertise (7th). Weapon Groups Basic Weapons, Maces and Clubs. Skills Appraise*+11 , Bluff*+12 , Diplomacy*+10 , Disguise*+6 , Heal*+5 , Intimidate*+9 , Knowledge: Arcana*+7 , Knowledge: Dungeoneering*+7 , Knowledge: Engineering*+7 , Knowledge: Geography*+8 , Knowledge: History*+ 18, Knowledge: Local (Inner Sea)*+7 , Knowledge: Nature*+7 , Knowledge: Nobility*+11 , Knowledge: Planar*+8 , Knowledge: Religion*+11 , Linguistics*+5 , Perception*+9 , Perform: Oratory*+7 , Ride*+7 , Sense Motive*+12 , Spellcraft*+10 , Swim*+4 . Languages Common (Taldane) R/W/S, Osiriani R/W/S, Infernal R/W/S, Speak Draconic. SQ Channel Energy 5/day (3d6 Neg, WDC 15), Orisons, Lore (as Bardic Knowledge), Favored Class: Cleric. Combat Gear Lesser Grimoire of Thrune: a bound collection of scrolls within a red leather cover embossed in gold with the symbol of Asmodeus, it contains the following scrolls: Command, Comprehend Languages, Death Knell, Detect Secret Doors (2), Detect Undead, Hide from Undead (2), Protection from Evil and Sanctuary, Scroll of Stone Shape, Scroll of Divination, Wand of Cure Light Wounds (34 charges). Other Gear +2 Leather Armor, Periapt of Wisdom +2 (large Black Pearl on black gold chain)[i], [i] Jade Mantis, Wracking Rod, Steel Devil-Headed Key, Small Steel Coffer (Devil Motif) containing the Aucturn Lexicon Notes, Steel Rod of Reverence (mwk Quarterstaff with a dark emerald continual flame cast upon it). Note that I changed some spell selections and such...gotta be prepared for things a bit different when you go into a Pyramid. Init +5 ; Senses Perception +11, Keen Senses (+2 Sight/Sound), Low-Light Vision. 1st - 2: Scent, Sniper's Shot. Feats Point Blank Shot (1st), Precise Shot (Combat Style, 2nd), Rapid Shot (3rd), Endurance (Bonus, 3rd), Weapon Focus: Bows (5th), Manyshot (7th). Weapon Groups Basic Weapons, Bows, Light Blades, Exotic Bows, Spears and Lances. Languages Common (Taldane) R/W/S, Elven R/W/S, Speak Osiriani, Speak Orcish, Speak Qadiran. SQ Keen Senses, Elven Immunities, Weapon Familiarity, Favored Class: Ranger, Track, Wild Empathy +6, Close Combat Shot (no AoO in melee with bow), Favored Terrain: Plains, Hunter's Bond (share FE bonus). Combat Gear 3 Potions of Cure Light Wounds, 2 Potions of Cure Moderate Wounds. Other Gear +2 Chain Shirt, Belt of Incredible Dexterity +2, Boots of Striding and Springing, Bag of Endless Caltrops, Quiver (20 arrows), adventuring gear (rope, grapple, etc), 50pp. Btw...one of the reasons I am posting this in this thread and not in my Campaign Journal thread is so that anyone else running J1 should feel free to use these updated versions if they'd like. They are all made using PFRPG rules, the same as on my Campaign Journal page. Thanks. Note that these characters are updated to reflect this being during the later part of the adventure. I haven't been updating NPCs to PRPG. I figure if Pathfinder RPG is truly being sold as backwards compatible you shouldn't have to rewrite NPCs. Obviously this makes the module a touch easier but on the other hand the monsters haven't been updated to Pathfinder either so it's going to be easier regardless. I agree with what you are saying Dennis, I chose to update these NPCs because I ran the adventure a little different to meet the needs of my character party. I didn't update any of the other Npcs and they did just fine in the encounters. I am updating these characters to present a more concrete challenge for my characters for the endgame. The trick is to use a module intended for characters one level higher. That seems to balance out a bit better. I'm not suggesting one way or the other is better. I guess what I am saying is I'm lazier than you :) My players haven't been around as much as many have so having the module be a little easier is good. I could use some help with areas 7-8. Also, how tall is the central platform? I guessed it was just higher than the coins, but I'm not sure. Thanks, I run this encounter tomorrow!!! Well, I made the half-moon walls surounding the center dias 5' above the coins, same as I figured the door levels and dias were. Made for an interesting terrain feature. I had the expeditionary move down the shaft from the upper levels while the constest with the dragon began. Since we are running this as a one-shot, I used the pregens, plus Harsk (awesome character). The dragon waged unholy war on the group, with Seoni the socerer blasting with multiple Scorching Rays. Since I leveled the characters at the base of the pyramid, this allowed Seoni two rays!! Regardless, I was able to breathe three times, and brought down 6 characters in the encounter, one who bled to death (Merisiel), as well as the Expeditionary members Hrosk (spelling? ), and Scepter; both turned to ash!!! I used the timing to join the groups, the Paracount gaining advantage (and all treasure from the center) buy using a scroll of Raise Dead (Asmodeous), on Merisiel. Afterwards, the player running Harsk, who constantly runs his dwarven mouth (like a good dwarf!) started to complain about the arrangement... When Julistar told the other memebers to call of their "dog" Harsk had enough and opened fire on the two remaining Expeditionary members... which was the perfect time to reveal that Neferet was NOT on their side. This one sounds like I just have to get it. I love the old dungeon-delve when it's well done, and I love pulp archaeology, and this sounds like both of those things. Being I have been running adventure paths since Burnt Offerings first made it's debut I had not have a chance to run many of the modules Paizo has done. But two days ago an old gaming friend came into town and we decided to have a one-off gaming day and I ran Entombed with the Pharaohs. It was a lot of fun and they players loved it. We did it in a day. I hope to run the sequel one day for the survivors (which is only three out of five). Cool! I had no idea.